We'll have details in the coming days on the timing and agenda for this meeting, marking the one-year anniversary of Indivisible: Conejo's first organizing meeting. 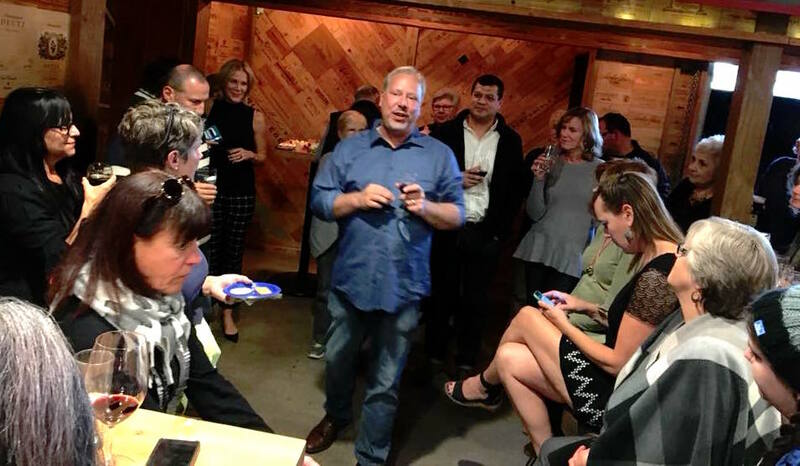 Thanks to the more than 70 activists who shared some holiday cheer -- not to mention plenty of fine wines and beers -- at Indivisible: Conejo's Holiday Wine Tasting & Open House on Sunday, Dec. 17! A number of first-time participants joined us at Wade's Wines in Westlake Village -- it was wonderful to meet you all! How We'll Use It in 2018! Activists perform "The Twelve Days of #TaxScam" during the "Knight-Mare Before Christmas" protest at Rep. Steve Knight's office in Simi Valley on Monday, Dec. 18. There's no two ways about it: Wednesday's final passage of the GOP tax bill is an infuriating loss for progressives -- particularly in high-tax states like California. Republicans ignored poll after poll showing that Americans disapprove of theirplans, and that we clearly see how the cuts benefit the Top 1% at the expense of the rest of us. They rammed through a bill that will affect every corner of the American economy without making the slightest effort to reach a bipartisan consensus; without holding a single public hearing on its merits; without obtaining "scores" on the bill's impacts from the Joint Committee on Taxation or the Congressional Budget Office. We have no way of knowing how much these cuts will affect the federal budget or the Gross Domestic Product -- but we do know that the Republicans' bill represents the most blatant looting of the federal treasury, and of the middle class, that we will see in our lifetimes. We know that the booming economy President Obama built, with low unemployment and high market values on Wall Street, doesn't currently require the sort of stimulus that a tax cut usually is designed to provide. And we know, from listening to CEOs themselves, that corporations do not plan to use their tax savings to pay higher wages to their workers or cut prices for consumers. Instead, they'll use those savings to buy back stock and provide increased dividends to shareholders -- thus exacerbating the tax scam's terrible impact on income and wealth inequality. Most of all, we Californians know that this law -- and particularly the limits it places on deductions for state and local tax payments as well as property taxes -- was designed by conservatives to hurt progressives, and to damage blue states like ours. Republicans have shown us who they truly are with this bill: gratuitously favoring their wealthy donors over everyone else, ignoring the majority of Americans who didn't vote for them and don't approve of their work, writing the bill in secret and ramming it through without the sort of legislative care Americans expect. The disdain with which conservatives view their fellow Americans, and the depths to which they'll sink to push through unpopular policies, were evident this month in the FCC's chambers as well, where Trump's FCC chairman Ajit Pai led a repeal of Net Neutrality protections favored by more than 80 percent of Americans (including three-quarters of Republicans!). That same disdain has been on display locally: on the CVUSD school board, where a corrupt and backhanded process led to a censorship policy opposed by most of the community; and on the Thousand Oaks City Council, which is allowing a community resource (the Miller Family YMCA in Dos Vientos) to be sold off for the benefit of pastor-councilman Rob McCoy's church. The silver lining in this dark cloud is that the American people clearly see what Trump, Mitch McConnell, Paul Ryan and their fellow Republicans have been up to -- and they don't like it one bit. Republicans such as Rep. Steve Knight, who voted in direct opposition to his own constituents' interests, have shown voters that their party's moral and intellectual degradation didn't begin with and isn't limited to Trump. In the process, they've handed us the tools we need to end their careers in 2018. We will spend the next 10 months reminding voters relentlessly of the unethical and secretive machinations that led to this scam -- one that will raise taxes on tens of millions of Americans who can't afford it, while slashing the tax burdens of fat cats who don't need the relief. With Doug Jones' election last week changing the political calculus in the Senate, Republicans likely won't find it so easy to repeat their looting of the middle class when they come after Social Security, Medicare and other elements of the safety net next year. Indivisible: Conejo, like every other element of the Resistance, will fight for every inch of ground to stop Republicans from getting their way. At the same time, we'll use our outrage and disgust over the #TrumpTaxScam to fuel our passion for registering and turning out voters in the 25th district and elsewhere. If it wasn't clear before, it most certainly is now: Opposing Trump and anticipating his removal from office isn't nearly enough. We MUST retake Congress in 2018 and create a government that once again represents the will and the interests of the American people! 12/12 - Save Net Neutrality! 12/13 - Demand Action on CHIP, Dreamers, Doug Jones Now! 12/20 - Tell Feinstein: #NoDreamNoDeal! "Led by Mike Dunn, the Conejo Valley Unified School District (CVUSD) board in California attempted to ban the teaching of Sherman Alexie’s National Book Award-winning novel, The Absolutely True Diary of a Part-Time Indian. The attempt failed, but the board subsequently instituted a policy that requires school officials to warn parents when classroom teaching lists contain “mature” material. The board has taken additional steps to limit the influence of educators in making curricular decisions. By weighting the views of a few community members over the opinions of trained educators, Mike Dunn’s board has threatened the quality of education for all students in the district." The group has two meetings scheduled during January with members of the Ventura County Board of Supervisors, to request a Sheriff Civilian Oversight Committee. The team also will kick off the new year with a canvassing trip to California's 21st congressional district, to help rid the Central Valley of Republican Rep. David Valadao. Team members have been tracking the progress of Los Angeles Community Choice Energy, a public authority that will buy and sell electricity drawn from renewable sources and will compete with Southern California Edison. Communities were given a Dec. 27 deadline to sign on with the initiative -- and as of last week the city councils of Thousand Oaks, Agoura Hills, Calabasas, Oxnard and Ojai, along with the Los Angeles and Ventura County boards of supervisors, have agreed to allow residents to participate. Residential customers will begin joining the initiative during the fall of 2018. Team members will attend a fundraiser for next summer's first-ever Conejo Valley Pride festival on Thursday, January 4, at Brendan's Irish Pub in Camarillo. This fundraiser previously was scheduled for early December but was postponed because of the Thomas Fire.